At the end of last month we had an impromptu weekend away in the Sunny town of Margate, in Kent. Margate had been on our minds for a couple of years as a great place to visit for a weekend away. It’s just under 2 hours from London, and we’d heard lots of good things. Sandy beaches with a nostalgic feel, plenty of independent shops and food spots to explore, as well as the iconic Dreamland amusement park. With the glorious weather continuing (we’ve been having a rare heatwave here in the UK) and a free weekend, we thought let’s make the most of the warm sunny weather and head down to Kent and explore. A traditional seaside resort for over 250 years, Margate and Ramsgate have always been a popular destination for Londoners looking to escape the city, thanks to their sandy beaches and holiday atmosphere. Since 2011 and the opening of The Turner Contemporary, and 2012, with Margate being chosen as one of the towns to benefit from the Portas Pilot Scheme, the area has undergone lots of regeneration, making Margate once again a popular destination for not only Londoners, but tourists from far and wide. We drove to Margate from Essex, (there are good train links from London too) and the journey took us around 3 hours, but we did stop off on the way. We arrived in Margate around 3pm, and decided to head straight to Dreamland. The parking here was just £5 for the whole day, and seeing as our accommodation for the night was in Ramsgate, we were keen to get Dreamland ticked off our travel list and get a look at the main Margate Sands Beach. 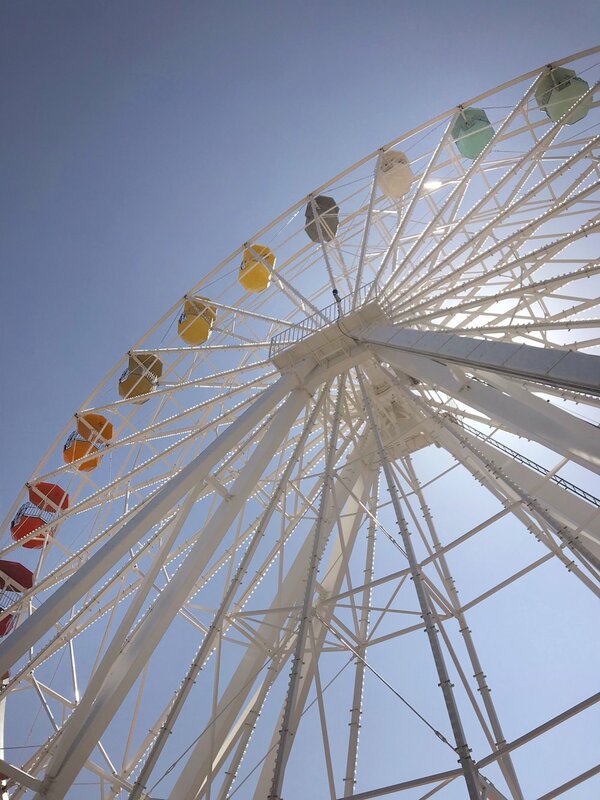 You can’t miss Dreamland, it’s right on the main street opposite Margate Sands Beach, with its big colourful wheel and retro yellow signage, (I loved all the typefaces and illustrations used). Originally opened in 1880 (would you believe) the Dreamland park has undergone massive regeneration, after a decline in the early 2000. It was so lovely to see it again full of life and restored to a traditional seaside funfair. The original Dreamland features in one of the funniest episodes of Only Fools and Horses too - ‘The Jolly Boys Outing’, so be sure to watch this before you go if you’ve never seen it. Dreamland offers so much more than just fairground rides. It’s now an entertainment centre, roller disco, theatre and music venue. It’s most definitely worth a visit, and there’s something for everyone as it just brings back those nostalgic feels from childhood visiting the seaside, a British tradition that you just don’t get in other places. 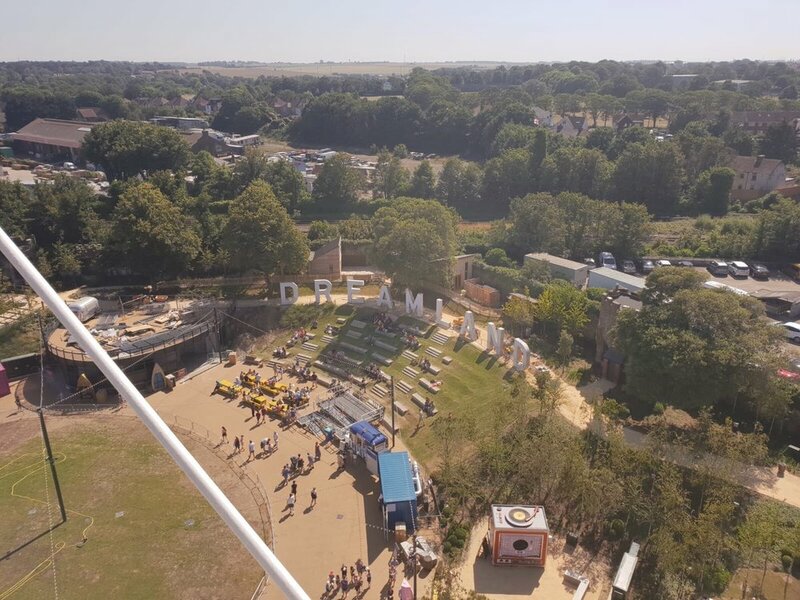 As it was fairly late in the day, we just paid the £5 admission, which gives you entry to the park and access to one ride, but there’s plenty of options if you want to spend the day there to get on all of the rides and attractions. You can also prebook your wristbands which gives you a 15% saving, or just top up your wristband as you go. There’s plenty of rides for all ages and tastes, from the traditional to the more contemporary, as well as performances and events most days. We decided to use our Dreamland wristbands for the Big Wheel, as it seemed like the most iconic. I loved the pastel coloured carriages, which gave us the best view of Margate and its rolling sandy beach. It was a lovely way to start our weekend exploring the area. After our Dreamland visit, we wandered along the main beach, past the traditional seaside amusements and pubs, and made our way to Margate Old Town (around a 5-10 min walk from the Dreamland area). You’ll know it once you reach it, as the busy more contemporary buildings, begin to change to beautiful traditional victorian style structures and shops, and you’ll notice the Turner Contemporary centre opposite. Margate Old Town had to be one of my favourite stops during our visit to Margate. Filled with fabulous independent and vintage shops, it’s almost like a little haven, away from the hustle and bustle of the main sands. It’s got a villagy feel you would expect from a smaller seaside town, definitely not as big as one like Margate. I’d definitely recommend a couple of hours browsing the shops and visiting the little cafes here, as it’s just so pretty seeing all the vintage retro shop windows. It instantly transports you back to a time when our highstreets weren’t all filled with the same big brand names, and artisan sellers were selling their wares. Little Bit - a gorgeously colourful emporium of gifts, treats, stationery and homeware. You won’t miss their gorgeous polka dot coverered shop exterior. Once inside the amazingness continues with a shop filled with cool indie designers, and bright and colourful displays. Its a great place to pick up gifts for loved ones (or yourself) and you just walk out feeling happy. Peony Vintage - A completely pink vintage shop that instantly transports you back to the swinging 60s, had to be my favourite of all the shops. 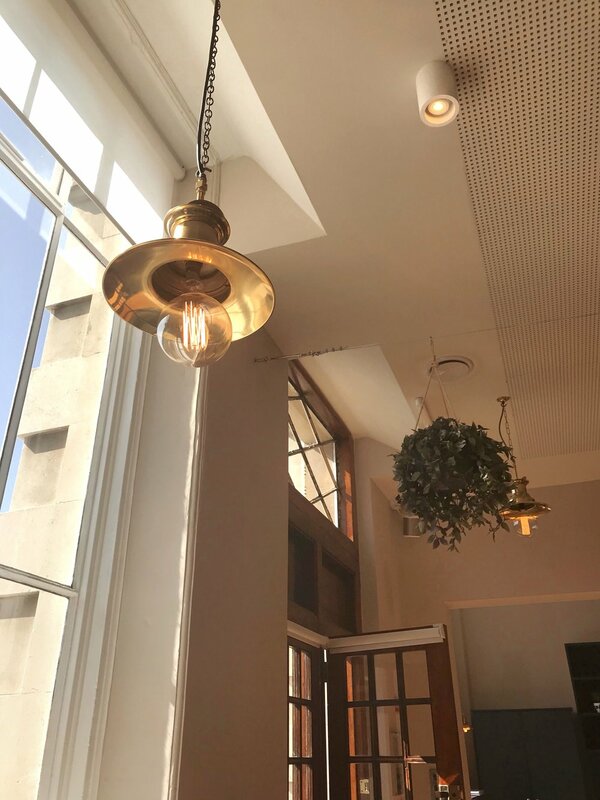 Founder Georgie Roberton handpicks all the items on sale, as well as designing and making her own jewellry range which can also be bought in store. The prints and fabrics here for me were a wonder and I loved all the bold floral and retro colours, I was completely in my element. If you love vintage then this is the place for you. Artisans and Adventurers - A gorgeously green shop traditional shop front housing lovely items from small artisan enterprises across the globe. Not the traditional ethical aesthetic you’d expect, as there’s still that vintage vibe, but I loved the mix of products that were clearly chosen with love by owners Amy Fleuriot and Bee Friedmann. They also have a sister store in Columbia Road, Hackney which is just as awesome. 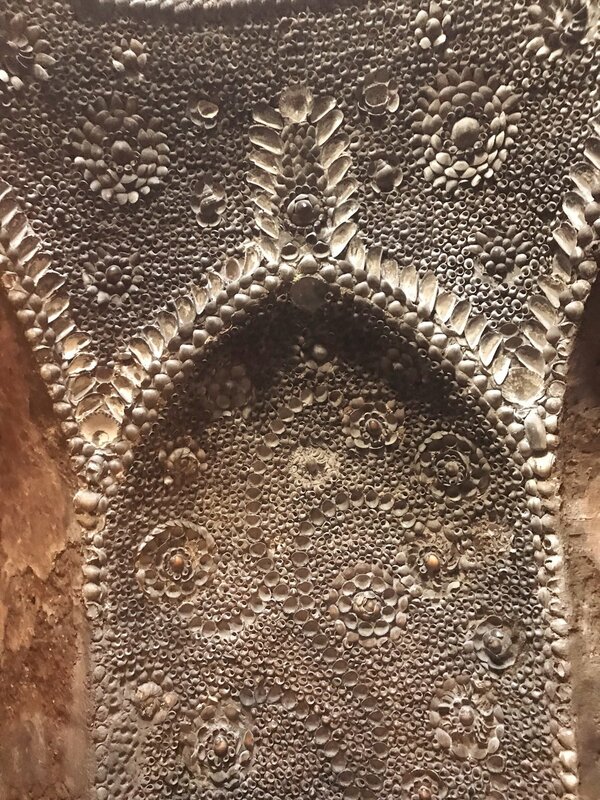 One of the most random and unique finds in Margate, HAS to be The Shell Grotto. It was one of those places that we didn’t know very much about before arriving, and to be honest when we found the aptly named Grotto Hill, it just looked like we had arrived at a very ordinary shell gift shop, typical of seaside resorts like Margate. Oh how very wrong were we! 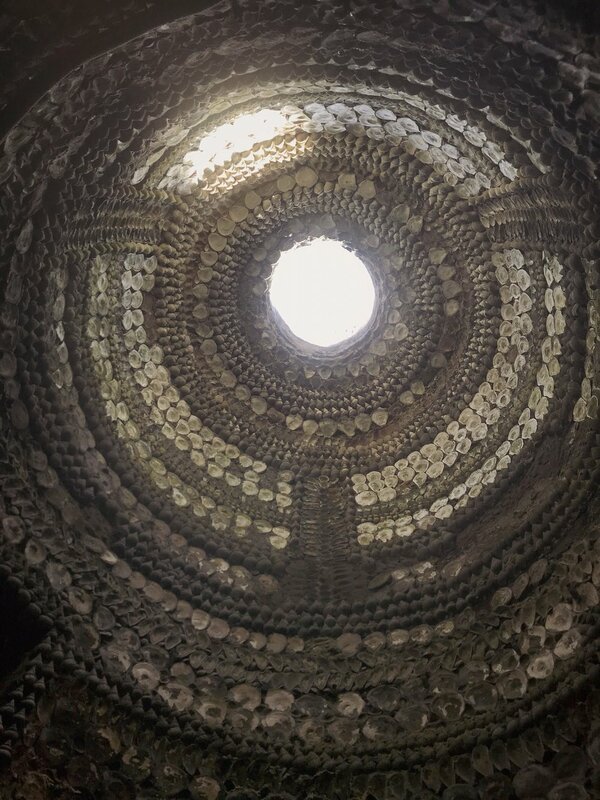 Once inside and through the shop, we made our way down to the Grotto, a beautiful underground tunnel and rooms, made up of over 4 million shells. And this is the best bit, nobody knows why the shell covered tunnels (almost 100 ft underground) are there. Discovered in 1830, by a family who leased the land their children found the tunnel while playing. Back in the 18th century, shell grottos were a thing generally built as architectural novelties in grand stately houses, not in rural areas, which would have been where the site sits now. It’s all very mysterious, which adds to the fun when you visit. For us, heading down into the tunnels gave us our very own Goonies moment. The gloomy low lit tunnels, covered in cryptic patterns constructed entirely from shells, made us want to look for hidden pirate treasure and solve the mystery of one eyed Willy. All jokes aside, it really is a special place. My favourite part was the circular centre where the tunnels divide, letting the light in from outside. Don’t forget to look up and get a snap. After our Goonies adventure at The Shell Grotto, it was time for some food. We’d wandered past The Post Office on our way to visit the grotto, and it looked beautiful, so we’d already said we’d pop back later. The Post Office or Old Post Office, as it’s also known, is situated on Union Crescent and was Margate’s main Post Office for over 100 years. 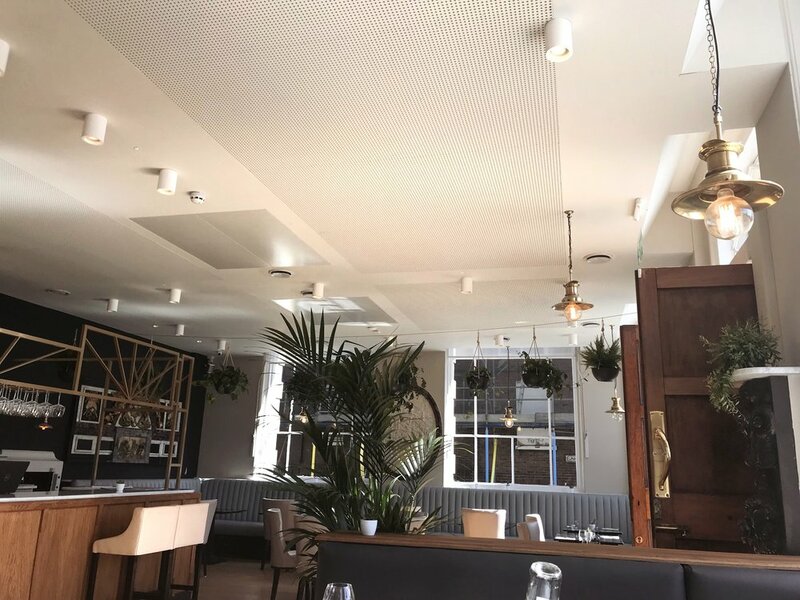 When that got moved up into the high street, the beautiful Grade II listed building has since been transformed into a beautiful space to dine and socialise. I absolutely loved the decor here, and the staff and service were second to none. When we arrived it was after 4pm, so we had missed the lunch times, and we were also too early for dinner, but the staff wouldn’t see us go hungry, and cooked us the most delicious chicken, chips and gravy. Yes not the most traditional of seaside lunches, but it was what we fancied at the time, and was delicious. There’s a lovely selection on the menu too, something for everyone, and the restaurant focuses on using local suppliers which I loved too. Would highly recommend a visit to The Post Office when you’re in Margate, I’d definitely go back, on the loveliness of the staff alone. We definitely left as happy customers! We didn’t really spend much time along the main sands beach area of Margate, mainly because of how late in the day we arrived, and how busy the beach was (it was a gloriously sunny warm Saturday in July) but I couldn’t not write the post without giving it a mention. The whole resort is typically British, and instantly transports you back to childhood trips to the seaside, with Punch and Judy, Margate rock and candy floss, and all that fun stuff that you just don’t find anywhere else but in the UK. It’s a vibrant area overall, with the hustle and bustle of a busy beachside resort town that you would expect from a place like Margate. After our late lunch we wandered back along Margate Main Sands and spied a couple of lovely bar terraces. With the sun hanging low, it was time to grab a late afternoon drink (I had a couple of Pimms) and sit and watch the world go by from a balcony. First stop was the very lovely Sands hotel, (I’d definietly go back here) which had a gorgeous bar and terrace overlooking the beach. 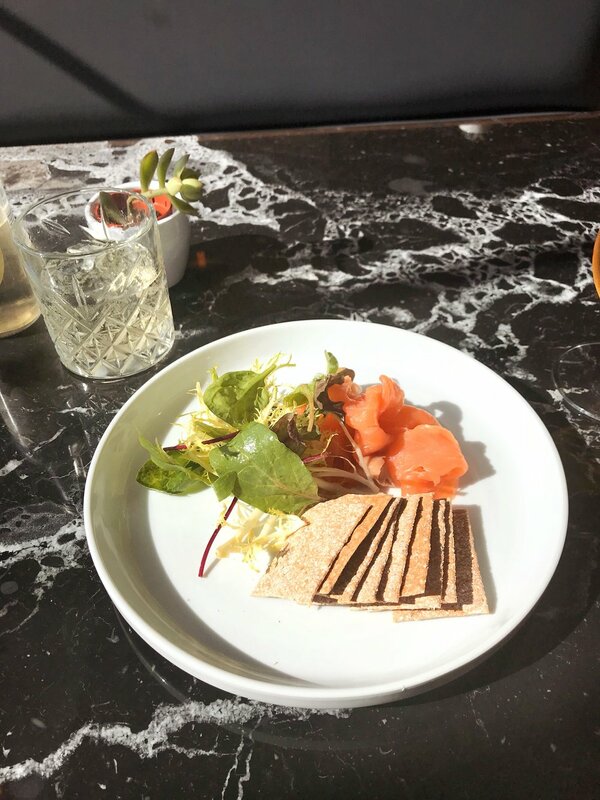 Then our second stop was right next door, Buoy and Oyster, which recently was named Kent restaurant of the year, another lovely spot for a bite to eat and some drinks too. Our first few hours in Kent had been a success and after a fair few hours traveling and being tourists in Margate, we decided to get back on the road again and head to our acommodation for the night. We were super excited to see the airbnb that we had booked, so we headed up to the Ramsgate area (about a 25 minute drive from Margate town. After a quick pitstop to pick up some essentials for the evening (wine, cheese and chocolate of course) we were soon enough at the American Style Tinyhouse. Situated in the beautiful setting of Minster, in Ramsgate and surrounded by rolling green fields, we instantly fell in love with the place. We found this particular place much nicer than some of the hotels and guest houses, we'd looked at previously, and on the whole (minus one scary one in Bali) we've always had good Airbnb stays. This one definitely stood out. The 2018 Trailhouse is a handbuilt tiny house on wheels, with toilet, outdoor shower, wood stove, kitchen and a queen sized bed. Hand built and designed by owners Diane and Tony, the American Style Tiny House might have been compact, but it had everything you needed plus lots of thoughtful homely touches including crossiants and fresh eggs for breakfast,a fab guide on what to see and do in the area, books and dvds, plus a lovely outdoor seating area, complete with firepit and BBQ. I have to also mention their gorgeous little dog, who came to say hello during our stay. After a long day traveling and exploring Margate, we relaxed next to the fire and enjoyed a glass of wine planning our next days adventure. It was the perfect end to a lovely day, and I’d definitely recommend staying at Diane and Tony’s place if you want to stay away from the hustle and bustle of Margate town and see some of the countryside in the area. The next morning, after a peaceful stay, and tea and crossants on the deck of the tinyhouse in the morning sunshine, we were back on the road again. Diane and Tony had been so helpful and given us so many tips on where to go and what to see, we were excited to explore some more, and the weather was glorious again. First stop on the list for Sunday was the Royal harbour Marina in Ramsgate. This area of Ramsgate had definitely kept more of a traditional seaside feel than margate, and I loved all the victorian style lampposts and bus shelters that you would expect from an area like this in the UK. Tony and Diane had recommended a visit to Addington Street. A quaint little road with the loveliest array of vintage and antique shops (parts reminded me of the Columbia Road area in London) and even though quite a few were still closed as it was an early Sunday morning, it was worth the walk. We found the really cool Vinyl Head Cafe and stopped for a coffee in their mirrored mosaic garden. After our caffeine fix we made our way back down the hill towards the Marina itself and took in the sights of all the boats bobbing up and down in the sea, and along the beach front, which was filling up fast with families and dog walkers heading for a day at the beach. Another quick beach area on our whistle stop beach tour of Kent was Botany Bay. Again we didn’t spend a massive amount of time here, we just went for a little walk to see the chalk cliffs for an hour, but I wanted to include it in my guide as again this is a really picturesque part of the UK. Botany Bay was said to have got it’s name from the smuggling era, when those caught smuggling goods were shipped off to prison in Botany Bay, Australia. I would have loved to have spent a bit more but time exploring the area, but it was just a bit too busy for us so we decided to head back to Margate for the last couple of things on our Margate list of things to do. After our whistle stop beach tour of Kent, we headed back into Margate Town. There were still a couple of spots we wanted to visit before making our way back to Essex - the Turner Contemporary being one of them. The building of the Turner Contemporary was one of the main reasons for the regeneration and investment in Margate, so we were keen to see what it was all about. Some say the building itself is its own work of art, others are less keen, and have said that it looks a bit alien in a traditional British beach side resort, like Margate, but I’ll leave that to your judgement when you visit. I quite liked the look and feel of the building (it was a cool haven away from the warm heat on a hot Sunday afternoon), and it’s most definitely worth a look when you visit Margate. It’s free to look around and there’s always interesting updated exhibits and workshops throughout the year. Animals and Us was the main exhibition being shown, which explored artists’ reflections on the relationship between humans and animals. We quite enjoyed the interactive parts of the exhibition (the animal hats and masks mainly, which I'm pretty sure were actually for the little people visiting the gallery) and even though the gallery itself was a lot smaller than I expected, there was lots to see from photography, film, to sculpture and paintings. All a mix of the more traditional to the contemporary day. After another full day, it was definitely time for a coffee and cake before the drive back to Essex, so we headed to the Northdown Road area of Margate, and to the colourful plant oasis of Mar Mar. I fell in love with the decor as soon as we were inside, as the white walls are filled with green plants and pops of colour come from the lovely bits and bobs in the shop area of Mar Mar. 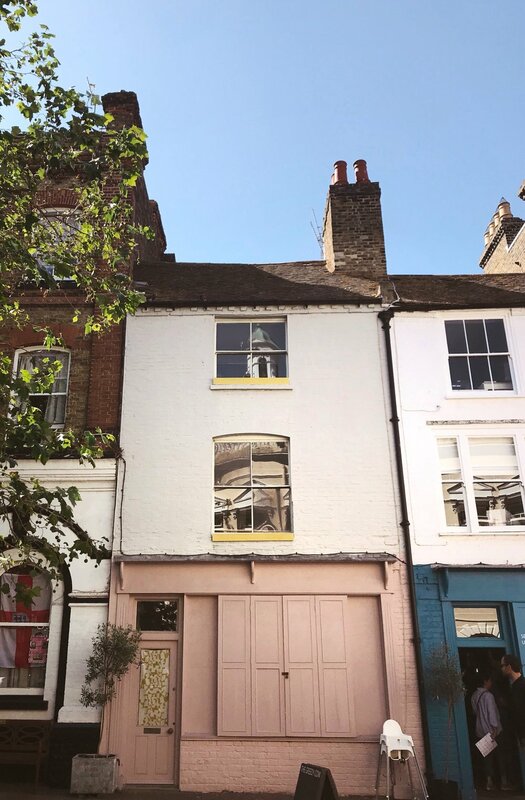 Tucked away from the main area of Margate, Mar Mar is certainly worth the walk if you’re looking for a cute colourful independent cafe for good coffee. If you’re a plant lover, this is certainly the place for you too. It’s a great shop to take home a souvenir or two, as there’s gorgeous artisan stationery and books, as well as beauty products and of course a new pot plant if you want one. We also made a little furry friend as we sat and ate our chocolate brownie. Not the traditional, stick of rock or candy floss end to a seaside weekend away, but it was perfect all the same.